The Los Angeles Rams will face off against the New England Patriots in Super Bowl 53 in Atlanta after wild AFC and NFC Championship games. As with any thrilling playoff matchup, both sides saw several heroes step up when it mattered most. Greg “The Leg” Zuerlein nailed two clutch field goals, John Johnson recorded a clutch interception of Drew Brees in overtime, and Tom Brady was Tom Brady in crunch time. There were also however several players that came through in the clutch on Sunday that won’t be as praised as they probably should be. Here is the biggest unsung hero from all four teams in the AFC and NFC Championships. 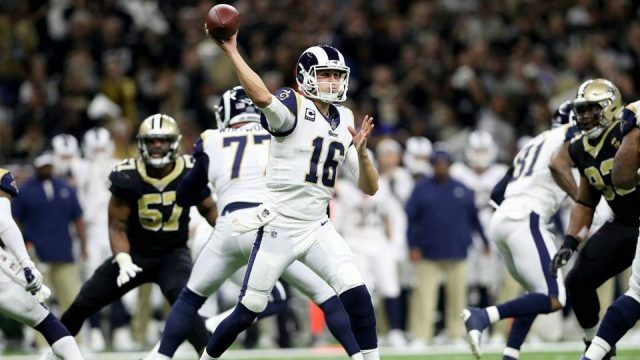 It doesn’t matter whether or not you believe Jared Goff is elite or a product of Sean McVay’s system, the young quarterback was incredibly clutch in the 2018 NFC Championship. His numbers weren’t crazy; just 297 yards, a touchdown, and an interception that wasn’t his fault. But he made some big plays when it mattered. His perfect pass to Brandin Cooks at the end of the first half set up Todd Gurley’s touchdown, allowing the Rams to claw back into the game. He made some big-time throws and third-down conversions to force overtime, then proceeded to make an incredibly athletic throw with pressure in his face to set up the winning field goal. The Saints have a bunch of talented players on defense, but linebacker Demario Davis was all over the field in New Orleans. Davis recorded 14 total tackles, a tackle and a half for a loss, broke up a pass, and intercepted Jared Goff in the first quarter. He kept McVay guessing all game long as New Orleans used him in a variety of different schemes, and he made the most of nearly all of them. Lattimore gets all the credit on the back end while Cam Jordan is praised up front, but Davis kept the Saints in it as long as he could. The Chiefs haven’t been hurting from the loss of Kareem Hunt thanks to some stellar play from Damien Williams. He only had 30 yards on the ground, but he made up for it with an additional 66 receiving yards and three total touchdowns. Even when the downfield threats weren’t open for Mahomes, Williams functioned as a nice safety blanket for the majority of the game. Too bad he never got to touch the ball in overtime. The former Georgia running back was an absolute monster at Arrowhead Stadium on Sunday. Brady may have been the hero late in the game, but it was Michel that allowed the Patriots to control the pace for the first three quarters. He may not be the typical New England receiving threat, but he still churned up 113 yards on the ground to go alongside his pair of touchdowns.